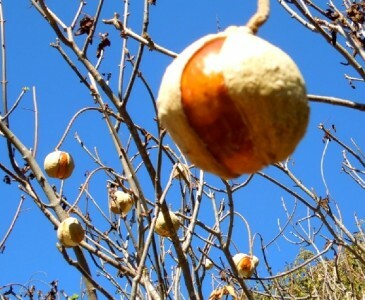 The California Buckeye tree looks almost unnatural in the fall with it’s bare tree limbs and giant seed pods that resemble deer eyeballs! 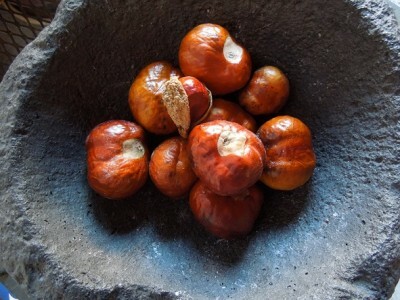 The smooth, chestnut-colored nuts drop out of their shells and onto the ground. Don’t eat them unless you know specific leaching techniques because they’re poisonous. 2. The flowers of the buckeye tree are poisonous to honey bees, so if you have lots of buckeyes on your property or plan to become a buckeye tree farmer, don’t become a bee keeper! 3. Having trouble catching fish? Could be the bait. Get sneaky and mash up the poisonous buckeye nut just like Californian Indian tribes. Throw it all in your fish pond of choice, make the fish stupid and reel in the big ones!!! 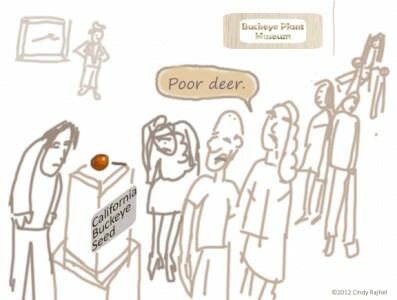 Poisonous buckeye nut makes museum goers stupid – they think it’s a real buck’s eyeball. Poor deer!